Shammi Kapoor, possibly Bollywood’s first dancing star, might not have been able to woo Sharmila Tagore without Rafi’s songs. I wasn’t even 6 when Mohammed Rafi passed away on 31 July 1980. But, in that age, when Facebook and WhatsApp hadn’t taken over our lives, listening to Rafi’s songs on the radio – few millennials will believe me if I told them that every home didn’t even have a black-and-white TV those days – brought us joy. Before we go any further, another admission: Despite studying in an English-medium convent school, I couldn’t understand most songs of Michael Jackson – a rage in my school days – or other English singers. But Rafi, along with Kishore Kumar, more than made up for that lapse. Baiju Bawra would not have been the classic that it turned out to be without the playback of Rafi. Songs like ‘Dil ke jharokhe mein tujh ko’ or ‘Chura liya hai tumne’ or ‘Chaudhvin ka chaand’ were often used to send signals to girls we were interested in (expressing interest in a young girl one thought one was in love with was difficult in those days). Remember Dev Anand with that cigarette hanging between his lips, singing ‘Main zindagi ka saath nibhata chala gaya’? Or, ‘Chand mera dil, chandni ho tum’? Or, ‘Khoya khoya chand’? Or, the evergreen ‘Badan pe sitare lapete huye’? All of them would not have been possible without the magic of Rafi. Shammi Kapoor, possibly Bollywood’s and India’s first dancing star, might not have been able to woo Sharmila Tagore without the songs sung by Rafi. Ditto for Dev Anand, the star who never got old, or superstar Dilip Kumar. But, it wasn’t his love songs that defined Rafi. When young men, and even women, were heartbroken or felt a bit down, Rafi came to their rescue with his ‘dard bhare nagme’. ‘Aaj purani raahon se, koi mujhe awaaz na de’, ‘Subah na aayi, shaam na aayi’, or ‘Yaad na jaye beete dinon ki’ and ‘Teri galiyon mein na rakhenge qadam aaj ke baad’ are just some of the unforgettables. The genre and the range that Rafi had remain unmatched even now. And, who but Rafi could have sung the immortal bhajans – many of them composed by Naushad. Go to YouTube and listen to just three songs – ‘Man tadpat Hari darshan ko aaj’, ‘Sukh ke sab saathi, dukh mein na koi’ and ‘O duniya ke rakhwale, sun dard bhare’ – and then let me know if anyone among the current lot of singers could have done justice to them. But of all the thousands of Rafi’s songs, the one closest to my heart is: ‘Kaun hai jo sapnon mein aaya’ from Jhuk Gaya Aasman. Rafisaab was a genius who was able to craft the modulation and the tone depending upon whom the song was to be picturised. Rajendra Kumar the Jubilee hero as he was known was courtesy Rafisaab whose best rendition has been for him. Dharampaaji, evergreen Dev Anand, jumping Jack Jeetendra, tragic star Dilip Kumar all owe their major success to this legend called Rafisaab !!! 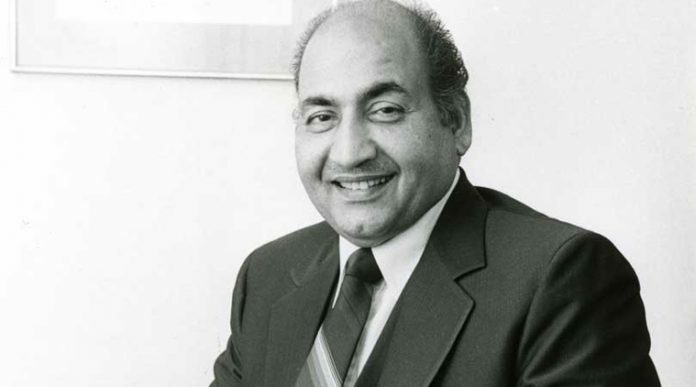 Rafi was a versatile genius well-versed in classical, light vocal, ghazal, hymns and romantic singing art ! He regaled music lovers all the world with his mastery of melody for decades together! The list of popular numbers is endless ! Hats off to that everlasting and unforgettable icon of art of singing ! No doubt Rafi was great singer. But it was unfortunate that he was made to song KAUON song, the tune was copied from Elvis Persley son Mangareitta! No other voice like Rafiji. Rafi saab will remain an unparalleled genius . To choose his best rendering is not possible. I repeat Rafi saab will remain an unparalleled genius. Good to read the only blog I could see on Great Rafi Saheb. Thanks for bringing his memory.